Yutaka Fukufuji is ready to ride the buses in hockey's backwaters a few more years if that's what it takes to make the NHL. 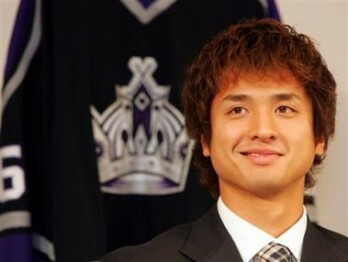 The Japanese goaltender signed a two-year contract with the Los Angeles Kings this month and will attend a rookie camp next month. "My goal is to play in the NHL," Fukufuji said at a news conference Thursday. "I know it will be tough, but I'm ready for rookie camp and I'm looking forward to taking on my rivals." While some have likened Fukufuji to baseball's Hideo Nomo, the soft-spoken goalie has other things on his mind than being a pioneer. With a dearth of proven talent on the roster, the Washington Capitals may be addressing the problem by turning back the clock. According to the Washington Times, the Capitals extended a contract offer to right wing Peter Bondra, the franchise's all-time leading scorer. Bondra, 37, spent his entire 13-season NHL career with the Caps before he was sent to Ottawa on Feb. 18, 2004, for center Brooks Laich. OLN, a television leader in action and adventure sports, and the National Hockey League (NHL) today announced that OLN will be the new national cable television home for the NHL. Under the terms of the multi-year agreement, OLN will televise at least 58 regular-season games. These games will air consistently on Monday and Tuesday nights and be exclusive to the network. OLN will carry the NHL All-Star Game exclusively in the US and will provide wall-to-wall coverage throughout the Stanley Cup Playoffs, including exclusive Conference Final action and the first two games of the Stanley Cup Final. 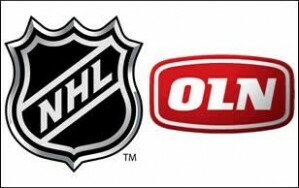 OLN will kick off NHL coverage beginning with the Rangers-Flyers match-up October 5, the first day of the new season. OLN and the NHL will bring television viewers closer to the ice by leveraging the League's new telecast enhancements -- increased behind-the-scenes access, microphones on the players and coaches, netcams and in-game interviews. The partnership between OLN, Comcast and the NHL will redefine the sport for hockey viewers. More action on video on demand (VOD), in HDTV and online will create an experience like never before, including: * VOD game highlights and library footage of hockey's greatest moments with full fast-forward, rewind and replay capability; * HDTV game coverage in a crisper, faster-moving, more exciting game for hockey fans every week; * Online streaming of two live games per night (subject to local blackout), broadband highlights, commentary, and library footage; * Round-the-clock coverage on the NHL Network, to be launched in the US in the future; and * Comcast will have the ability to carry and/or syndicate additional games on Comcast's regional sports networks where it has the consent of the local team and team's rights holder. "We are entering into a great partnership with the NHL. Hockey is excellent, exclusive programming for OLN and will be a marquee sport for the network. We are proud to be the new national television home of the NHL when the puck drops on October 5," said OLN President Gavin Harvey. "Adding hockey to our lineup when the NHL returns to the ice with a fresh season, new energy, new players and a new attitude adds tremendous value to OLN and builds upon the momentum of our other premier sports programming like the America's Cup and The Tour de France." "We recognize and appreciate that Comcast is making a tremendous investment in the NHL and that hockey will be a priority on OLN," NHL Commissioner Gary Bettman said. "This multifaceted partnership with OLN and Comcast creates exciting opportunities for our fans and for us, and we look forward to a terrific relationship in the years ahead." The NHL revised its schedule format, to emphasize divisional and conference rivalries, and implemented a number of changes that will reduce the number of play stoppages while heightening hockey's action, flow, offense and excitement. The attacking zone has been enlarged, and the goaltenders have been limited -- not only in the size of the equipment they will be allowed to wear but also in the areas of the ice where they will be allowed to play the puck. As well, the introduction of the shootout as a tiebreaker, featuring hockey's most exciting play, the breakaway, will ensure that every contest has a winner. "Comcast's leadership and innovation in delivering integrated sports and other entertainment on HDTV, VOD and on the Internet is being met with rave reviews from our customers. We will use this experience to bring the NHL to hockey fans in ways that they have never seen before," said Jeff Shell, President of Comcast Programming for Comcast Corporation. Additional details about the OLN television schedule, hockey commentators, HDTV and VOD schedules will be released as details become available. I have been doing a little research on the new NHL TV contract, and have been told INHD will be broadcasting the HD games. OLN HD which will be premiering in September will only be a video on demand service. Also, HDNET does not have any NHL games scheduled at this point and since they are in direct competition with INHD, they may not retain the rights to televise the NHL this year. The NHL Network will be available to US Comcast subscribers who have the digital package. On-line streaming may be a year away from going live but may become a reality a bit sooner. The Washington Capitals have re-signed forward Dainius Zubrus to a two-year contract, vice president and general manager George McPhee announced today. In keeping with club policy, terms of the agreement were not disclosed. A free autographed puck to one fan every time Dallas scores at home. A Luc Robitaille-signed jersey to season-ticket holders in Los Angeles. Dollar hot dogs in Nashville. A barbecue with the Bruins in Boston. Five-hundred free tickets to each of 15 Tuesday night games in Montreal. Sacre bleu! NHL teams are romancing their fans. Hey, Tampa Bay's season-ticket holders even get a re-engagement ring -- a replica of the one Lightning players earned for winning the 2004 Stanley Cup. It's all part of each team's marketing effort after the first work stoppage in history to wipe out an entire pro sports season. Each franchise devised its own strategy, and most started with a rollback in ticket prices. The Sharks are among the teams that lowered prices, an average of 10 percent for season tickets and 6.5 percent for single games. But beyond that, they've been relatively quiet while other teams have announced a host of giveaways, gimmicks and special events. ``Some teams may make more of a quick splash,'' said Malcolm Bordelon, the Sharks' executive vice president of business operations. ``Our preference is to spread it throughout the year.'' Still, it won't be business as usual on opening night. With hockey being a huge part of my family, I was invited on a trip to Toronto two weeks ago to see the Hockey Hall of Fame. Soon enough, my bags were packed and I was on my way up north. Having never been to a Hall of Fame before, I had no idea of what to expect. With all the traveling done, I was finally in Toronto. We had gotten to our campsite outside the city around 9 p.m. and had to wait another day to go to the Hall of Fame. The night passed and we headed to the city the next day at around 3:45. Using public transportation and our "great navigational skills" we had arrived at the Hall of Fame at 5. With Marian Hossa's potentially expensive arbitration hearing less than a week away, the Ottawa Senators have good reason to be nervous. They're running out of room under the $39-million U.S. salary cap. For the 17 players who will definitely be in NHL uniforms this fall, they already have $31,054,400 committed. Todd Bertuzzi says he has never wanted out of Vancouver, because he has built some things in this city -- his relationship with the fans, his relationship with Markus Naslund and his reputation as one of the NHL's best players -- that he could never replace. But during the worst of it, when the world was closing in around him after March 8, 2004, -- after the punch from behind on Steve Moore had led to what would be a 17-month, 20-game suspension -- Bertuzzi wondered if he could ever come back to Vancouver or if things would ever be the same. From the entry 'Don Cherry talks Babcock, again'. From the entry 'Open Post- Game 4 Western Conference Finals, Anaheim Ducks vs. Chicago Blackhaw4'. From the entry 'Evening Line- Steve Simmons'. From the entry 'Video- Brandon Saad's Short-Handed Goal Tonight'.